Still I love it, and always have felt that the critics protested too much. After all, an antisemitic cloud hovers over the plot, and the population of Anatevka does end up being expelled from the Pale. This musical was never simply one long hora. Joel Grey’s Yiddish-language production, just closing at the Museum of Jewish Heritage in New York and making aliyah to the Theatre District, makes that point clearer than it’s ever been. Since (the English-language) Fiddler is now more than a half-century old, we can better appreciate the context in which it appeared. Historian Rachel Kranston sees Fiddler as an expression of the “ambivalent embrace” of post-WW2 American Jewry’s flight to the suburbs. While many Jewish families found comfort and economic success, thoughtful Jews of that generation understood that big sacrifices were being made when they left the cities. Jewish leaders worried that with prosperity there would be a spiritual descent, a loss of multigenerational intimacies, and a turn towards political conservatism that comes with not seeing the daily struggles of your neighbors. Fiddler—along with the photo-essays of Roman Vishniac and Abraham Joshua Heschel’s The Earth is the Lord’s—were romanticizations of the past, signs of a generation sensing that something precious was being lost. Celebrating Yiddish, too, carries the same risks. The language of the daily life of Ashkenazi Jews for centuries, Yiddish was the primary vehicle of their spirituality, their wit, and their literary character. Unfortunately, Yiddish for many people connotes lazy nostalgia or borsht-belt vulgarity. The author and scholar Dovid Katz upends most of this conventional wisdom in an entertaining history of Yiddish, including the mistaken notion that Yiddish is in decline. The truth is that Yiddish is alive and well and embraces more speakers every year. It’s just that almost all of them are Haredi (ultra-Orthodox Jews)—not the sort of mamaloshen that most nostalgists have in mind. Fiddler on the Roof being performed in Yiddish is a great experience, and aims to restore some of those losses. One thing that always rang hollow was its clunky use of Jewish language. Take, for instance, the “Sabbath Prayer.” No Jew says “Sabbath”, of course; that’s Jewish-in-translation for outsiders peering in through a window. But would any audience have been confused because of the word “Shabbos”? Surely not. Even if Fiddler were being performed by a public high school in Fort Smith, Arkansas, the audience would have understood. So why the coyness? Same goes with “Torah”—or, better, the Yiddish Toyre—instead of Tevye’s constantly invoking the “Good Book” like a frum John Calvin. In the minimalist set of this Yiddish production, a backdrop with the word תורה shadows the set. At first I thought it was a hokey device—until the culmination of the first act. During Tzeitl’s and Motl’s wedding, Russian thugs vandalize the town and beat up the Jews and, at the scene’s climax, rip the tableau “Torah” in half. It’s an unexpectedly visceral and powerful moment. Similarly, there’s something restorative about reading the spellings of the names in the playbill—“Motl”, “Hodl”, “Khave”, “Leyzer-Volf”, “Anatevke”—rather than their more familiar, ever-so-slightly Americanized versions. My grandmother never called the Yiddish language “Yiddish”—she just called it “Jewish.” Which is, of course, what it means. And she had a point. Just as Robert Frost once defined “poetry” as “that which is lost in translation”, so too does Judaism in translation lose some of its Jewishness. Language means everything in Judaism. “The Sabbath” is not “Shabbos”, “the Good Book” is not “Torah”, “charity” is not “Tzedakah”, and a “house of worship” is not a “shul.” The Yiddish Fiddler restores so much of this to the rhythms and cadences of songs and dialogue that have entered our vernacular. Despite a half-century of rabbis’ and scholars’ gripes about Fiddler, I’ll keep going to see it forever. It is a Jewish-American landmark, and deservedly so: There is just so much memory of Jewish pain coursing though its veins. 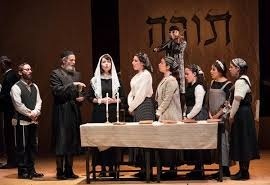 But Yiddish is the most effective vessel of that pain and that memory, and having seen Fiddler in Yiddish, I don’t think I’ll ever again enjoy English versions of the play quite as much.